More than 29 million American adults have diabetes, and about a quarter of them don’t realize it. Finding the right care is key to preventing and treating this disease. As an internal medicine physician, Michael Temkin, DO is trained in diagnosing and treating chronic diseases like diabetes. 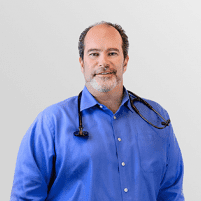 At his primary care practice in San Ramon, California, he works closely with patients to establish an effective treatment plan for preventing and treating diabetes. Diabetes is a chronic disease in which the body’s ability to produce or respond to the hormone insulin is impaired. Insulin acts like a key that opens your cells, allowing glucose (sugar) to enter and be used for energy. With diabetes, this system doesn’t work properly, and the sugar builds up in the blood. As a result, over time the high blood sugar levels can damage the kidneys, nerves, eyes, and heart leading to serious complications. If you have diabetes or prediabetes, it’s important to find a doctor who can help treat and manage your disease. Type 1 diabetes is an autoimmune problem where the immune system attacks the pancreas, damaging it so it can no longer make insulin. People with this type of diabetes need to take insulin injections to manage their blood sugar. Type 2 diabetes is also known as non-insulin dependent or adult-onset diabetes. Patients can produce some of their own insulin, but it’s usually not a sufficient amount or “insulin resistance” occurs, meaning the cells don’t respond to the insulin in a normal way. What is Dr. Temkin’s approach to treating diabetes? Dr. Temkin takes a proactive approach to managing diabetes so that patients get their blood sugar under control to prevent long-term complications. He helps patients modify their lifestyles by eating a healthy diet, being active -- and losing weight, if necessary -- in order to reduce the impact of the disease. For patients with type 2 diabetes, if diet and exercise aren’t enough to get blood sugar under control, he may prescribe oral medications to help the body use its own insulin more efficiently. He helps patients with type 1 diabetes manage their insulin dosage and blood sugar monitoring. How can the LeanMD program help treat diabetes? Because excess weight often contributes to both the onset of diabetes and its complications, losing weight can be a critical factor in treating the disease. With Dr. Temkin’s LeanMD program, weight loss primarily occurs through eating small portions of nutritionally-dense whole foods that are high in protein and low in carbohydrates. While exercise is not a requirement of the program, engaging in light activity is especially important for diabetes patients who need to change their sedentary lifestyle. Can Dr. Temkin help with prediabetes? Absolutely. More than a third of American adults have prediabetes, but most aren’t aware of it. With prediabetes, a patient’s blood sugar levels are higher than normal, but not high enough to be diagnosed as diabetes. Because prediabetes can lead to type 2 diabetes, which increases the risk of heart disease and stroke, it’s important to establish an effective treatment plan as soon as possible.